How would you describe your experience on the throne as the Emir of Kanam? What has been the most interesting part of being an Emir? I think it is when you have your people’s support to be their Emir. What that means is that they completely trust you. For me, it is the most important aspect of life. As a prince, your hope and aspiration would be to follow in the footsteps of your forefathers by being on the throne someday. And on the day you are called upon out of hundreds and thousands of others, nominated and confirmed to be on the throne, you know it is something so great. It is a rare privilege. So the day I was called upon to be the Emir was a very great day indeed. I succeeded my parents at the age of 32. And I have now spent 14 years on the throne. What were you doing before you became the Emir of Kanam? I was a young prince who was giving his grandfather support. The most interesting part of it is that I was born in the palace. My dad left for school when I was seven months in my mother’s womb and then, she was moved into the palace. My grandfather was so anxious to welcome his grandchild. So I grew up in the palace. After my father returned, I returned to my father’s house but I maintained a very close relationship with my grandfather. When I finished from secondary school, my grandfather took me under his wing. I was assisting him to write letters and do other things that had to do with western education. And after I got a diploma certificate, my grandfather appointed me as his private secretary. So I was the private secretary of the late Emir and I served him for 15 years before it pleased God for me to succeed him on the throne. While serving as his private secretary, I was also in the university as an undergraduate. In fact, I had to return home every week from Jos to ensure that everything was going well as regards doing my job. I was handling many responsibilities in the palace and doing other duties that had to do with the traditional institution here in Kanam before my ascension to the throne. I did not have much time to engage in some activities youths of my age engaged in as I was seriously engaged by palace activities not knowing that I was being groomed for greater responsibility at the palace as an Emir. So, I thank God for everything. How much do you miss your old life? I can say that I never missed any old life because except for a brief period when I was in secondary school, I can say that my life, while growing up, revolved round the palace. So the life I was leaving before becoming the Emir is the life that I have continued to live. I only miss my grandfather. You know, my grandfather was ill for three years before he died. He had a mild stroke and so, he could neither walk nor talk. I was the one doing the speaking and the walking for him. I would assist him to sit on the throne and then sit beside him and together, we would do the job. He would nod his head to say yes to the issue brought before him in the palace or shake it to say no, signifying his disapproval if that was the case. That was how we worked together throughout the period he was ill.
How did you feel when you got to know that you would succeed your grandfather on the throne? Honestly, I felt very grateful to God and I also felt so complete. But somehow, it was a moment of joy on the one hand and sadness on the other hand. This was because my late father was being decorated as the crown prince as he was not there to wear the crown. It would have been him but in God’s infinite mercy, He did it the way He wanted it. I was officially announced by the government as the new Emir on March 30, 2005, but the selection exercise was done the previous day. During the contest, I was told that I scored three votes to emerge as the Emir while the other contender scored only one vote. We were seven that contested the position but two people were eventually nominated and voted for. How have you been able to ensure that there is peace in Kanam Emirate which has people of many tribes living there, including Hausa, Boghom, Igbo, Jahr, Basharawa and Yoruba? The secret behind whatever successes we have recorded on the throne is through total submission to the will of God and engaging my people at every stage of affairs. I allow them to state their views and I say mine after that, then we find a common ground. You see, the traditional monarchy in modern times is not the same with how it was practised in those days. Now, it must come with globalisation. You must have an open-door policy that will give room for people to talk and you advise. And then, they look at you as their leader and they accept it. Don’t forget that I rule over people who have the fear of God. When you have people of that nature, everything is made much easier for you as a leader. In Kanam, we have both Muslims and Christians. And in every household in Kanam, you find a mixture of adherents of both religions as family members linked by blood. Even in my house, I’m the Emir of Kanam and I’m a Muslim. I totally believe in Islam but I have brothers and sisters who are Christians. I also have heirs to this throne (referring to the Emir) who are also not Muslims. We look at one another as one irrespective of the religion you profess. If you want to fight, who are you going to fight with? Are you going to fight your brothers or sisters because of religion or what? 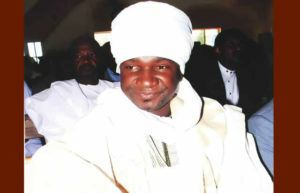 In one of the churches in Jos, the late Emir’s sister, who is called Mama Kauna, is currently the head of choristers. In Kanam, you hear somebody bearing a Muslim name, but you may later find out that he is a Christian or the other way round. There are so many interesting things to tell you about how we have been living as one people in Kanam. So, that has been the secret. What has been your biggest challenge since you became the Emir? I don’t think I have any challenge that is beyond my control. I must always thank God for that because He is the one who has been helping us. Can you give us a brief history of Kanam? Kanam is one of the oldest traditional institutions in Plateau State; it even predates Plateau State or even when it was still called Benue-Plateau. The beauty of it is that Kanam is populated by people of different tribes, from various places. For example, we have the Boghom, who have other subtribes known as Kingboghom, Tankwal and Kingpi, where I come from. We also have the Jahr people who have a different dialect and also have subtribes made up of Mbat, Kantana and Garga. They all migrated and settled here. But when you look at the Boghom tribe, the subtribe called the Kingboghom started from an ancient man who happened to settle here earlier. When you talk of the Tankwal, most of them are the Jukuns from the Kwararafa extraction. You also find members of other tribes living peacefully in Kanam. But when you talk of the Kingpi where I hail from, know this royal house is an extraction of the royal house of Kano. We are from the subtribe of the Kutungbawas who were the rulers of Kano before the Jihad and precisely, the 37th Emir of Kano, known as Mohammad Sharefa. They were referred to as the Sarki Kano and often referred to as the seven Hausa before the Jihad. Our great, great grandfather, Mohammad Sharefa, ruled Kano from 1702 till the 1730s, and he fathered my great grandfather who migrated and settled here. He finally moved to this area around 1740 after settling briefly at Ningi, in the present day Bauchi State. So this royal house came here around 1740. On arrival, we met people here but they did not have a unified traditional institution. The people also had the problem of drought. But when our great grandfathers came in, they were able to provide solution to the problem of drought. So that was how we were known in their language as the people who brought out water when they dug the ground. Four clans exist in the community. We have those who do the selection of traditional rulers; we have those who rule as traditional rulers; we also have the kingmakers and we have another clan that is also part of the selection process. This is Kanam and this is the beauty of the community. It is often said that there has never been a religious crisis in Kanam. Is this true? What they told you is very true. Can you identify any part of the Kingdom experiencing crisis? I told you that Kanam occupies a peculiar place in history because even during the colonial period, it never experienced any crisis. Since that time, we have never waged any war and neither have we fought anybody. Even during the crisis of Jihadism, Bauchi did not in any way conquer Kanam. So what has been the secret? The truth is that the Kanam man believes in dialogue as the best method of resolving disputes as opposed to the use of violence. During the Nigerian Civil War, the then Emir of Kanam, Ibrahim Umaru, never allowed the shedding of blood of any Igbo man in Kanam, including the destruction of their shops and properties. They were adequately safeguarded. After the civil war, they came back and found their things intact. Even with the crises in different parts of Plateau State, you cannot find any occurring in Kanam. The crown prince I was talking about – my own father – who was serving as a director was killed during one of the crises outside Kanam. He was serving in Qua’an Local Government Area of the state and used to return to Kanam during weekends to see his sick father and return to work on Sunday. Then he was transferred to Barkin Ladi and he told us that he would either report at his new place of work in Barkin Ladi before coming to Kanam or come to Kanam first before reporting at his duty post. It was during one of those trips that he was killed. When that happened, the people of Kanam actually wanted to fight. Remember that my late grandfather was ill at the time and I was the one coordinating activities in the palace. So I asked them, why do you want to fight? Do you want to change our history of nonviolence in Kanam? Who are you going to fight? This man was killed outside Kanam? So why do you want to retaliate? Eventually, the people did not get violent because of their belief in God and His oneness in creation and He told us that every soul must taste death. So when death comes, no one can stop it. How big is Kanam Emirate? It is very big. If you travel from Dengi town to the eastern part, you will find out that we share boundary with Gombe State, where we call Kashere. In the southern part of Kanam is Taraba State. We have a vast area of virgin land in that axis. We have a densely populated palm forest at the border, that is between 30 and 35 kilometres long. And there are communities in those areas. In another part, we share boundary with Bauchi State. You will travel about 20km (from here) to get to where we share boundary with Bauchi State. Then there is an extension towards Wase, which is about 26 or 30km as well. And we also share boundary with Kanke Local Government Area of Plateau State. These areas are also densely populated and that tells you how large the emirate is. What festivals are celebrated in Kanam and what is their significance? You know life has changed with the passage of time. But the beauty of life is to be able to remember yesterday and that will be able to prepare you for the future. Before now, the ancient Kanam had its festivals. The ancient Kanam also had masqueraders and the festivals were celebrated at the end of the farming season to welcome the harvest season and thank God for bumper harvest. That is what we referred to as the Boghom Day, when all the communities and clans in Kanam would come together to celebrate. In this sense, Boghom does not mean the name of a clan. In those days, when the masqueraders appeared on the scene, there would be some you would not see, but you would hear them talking to you. They performed the necessary ritual and when the masquerader eventually came out, it would address the people as Boghom, and the people would bow as they responded to the masquerader. That was why the colonial masters referred to the people as the people of Boghom. The masquerader also came out during ascension to the throne of a new Emir. But today, those things have been relegated to the background because of the acceptance of Islam and Christianity by the people. What we have now are two major celebrations which are Sallah and Christmas. During any of the celebrations, the people pay homage to the Emir in the palace. What are the taboos in your community? They have been taken over again by Islam and Christianity. Before now, you could not ‘touch’ or have sexual contact with a virgin lady. If you tried to do that, the girl would tell you that she was on traditional oath of secrecy which forbade her from being touched by a man. Any man who went against her oath of secrecy would usually attract curse to himself and then, death would follow. Also, a woman is not expected to see as rituals are being performed in the land either by mistake or otherwise. If that happens, there is the likelihood that she will not be able to have a child again until certain rituals are performed on her behalf. But again, those taboos have all been taken over by Islamic and Christian beliefs. And talking about taboos again, before now, you were not permitted to do anything to crocodiles because they were ritually attached to the community. We saw them as the defenders of the community. Before my great grandfather started building this palace, this place was like a rallying point for rituals every year. But because he wanted to do away with that, he made this place the palace. All the crocodiles were removed by him and placed somewhere and they are still there, but the rituals associated with them have been discarded. We often hear that traditional rites for new kings involve a lot of rituals or special sacrifices, what was your experience? 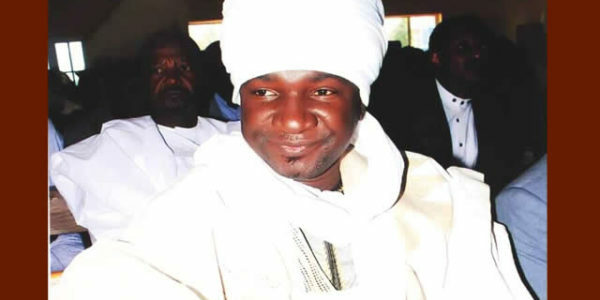 I have not done any sacrifice as an Emir. You can ask people around. Since I ascended the throne, I have never been asked to perform any sacrifice either. I am referring to my humble self and not my forefathers. I told you earlier that before now in the kingdom, there were sacrifices but Islam and Christianity have made people to stop such practices. So, as far as I’m concerned and as the seventh Emir of Kanam, I never did any sacrifice when I wanted to ascend the throne of my forefathers. I was given a turban, ushered in and I sat on the throne. So, there were no sacrifices and rituals involved. What are the things you cannot do as a king? You know, I’m a Muslim and I’m being guided by the tenets of Islam in whatever I do. Apart from that, I have no restriction. How has your style of dressing changed since you became an Emir? The Emir of Kanam has his own regalia and traditional attire. As you can see me now, I am just like you – a human being. The difference however is that I can’t stay with you without putting on a cap, but I can stay while being dressed casually. So, I can say that my dressing has not changed. And not only has my dressing not changed, I don’t drink alcohol and I don’t smoke. It has been like that even before I became the Emir of Kanam and it has also not changed after I became the Emir. What are the things you used to enjoy doing but now miss doing because you became the Emir and can no longer do them? I grew up in this community and from that time till now, I have not missed anything that I used to do before and now unable to do. I told you earlier that I was not given the chance to engage in other activities outside the palace. My life was not the usual youthful kind of life. Even when I was in colleges and the university, I never had a girlfriend. That’s me. How did you meet your first wife? It was when I was almost graduating that my father called me and said I was going to get married. I told him I did not have any girlfriend and he told me not to worry because they had got one for me. Fortunately, the person in question is my dad’s cousin and she became my first wife. And she was the one that married the other three wives for me. You may be interested in knowing how I married them as well. When I became the Emir of Kanam, my first wife told me she could not move into the big palace without another woman there as my second wife. And I told her again that I didn’t have a girlfriend. She told me she had one for me. And I said if it was fine by her, then it was fine by me too. That was how I married my second wife. My third wife came in here to greet the family and my first wife saw her. Again, she came to me and said, ‘Your Royal Highness, I have seen another one that is to your taste’. I said she should go ahead and talk to her. She is from Kaduna. And my last wife is my cousin’s sister. What did you see in your first wife that you liked when you first saw her? There was nothing I could mention except to say that she was a perfect choice made for me by my father. That was it. I obeyed and there has never been any regret for obeying his choice of marriage for me. Even if there is an issue, it will be from the ones I married after I became the Emir but I tackle the challenges as they come by doing the best (I can do), accommodating them, and asking them to correct themselves. The mother of my first wife is the younger sister of the late Emir whom I succeeded. My father is the son of the late Emir. Everything about her is attractive; she is obedient, so loving, caring and submissive. She is the best wife any man can have because I have never had any complaint about her. I married her in 1998. My first child with her is now 19 years old. Since traditional rulers are restrained from doing many things, how do you relax? Although leadership comes with responsibilities but despite that, I think traditional rulers do have time to relax and the Emir is not an exception. So here in the palace, I do have time to relax with my family, do exercises and other personal engagements. I also have time for visitation and so on. It depends on how you schedule your activities. I come to the palace by 9am and leave by 12pm every day. But I can come back if there is an emergency. That is how we have been doing it. Like Kanam, Nigeria is a multicultural society but unlike Nigeria, there is peace and religious tolerance in Kanam. What lessons can Nigeria learn from Kanam? In Nigeria, leaders must be helpful to the people and listen to them. When you and the people begin to contend with issues that you need not take like that, you are bound to have problems as a leader. Again, leaders should encourage the people to do their best and at the same time, try to lead by example. They should appreciate the opportunity given to them to lead the people and not to see it as an opportunity to lord it over the people. Not only that, Nigerian leaders must accommodate the different tribes and types of people in their domain. Above all, they must be truthful to the citizens and be open in their dealings with the people. They should also tell no lies to the people and relate with them always without segregation. This is the principle and method of our leadership in Kanam, which has made the kingdom to remain peaceful over the years.